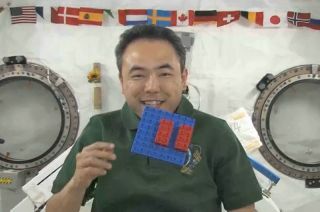 Japanese astronaut Satoshi Furukawa floats with LEGO (DUPLO) bricks aboard the International Space Station in 2011. The toys are now set to come home to Earth in March 2013. For the astronauts living on the International Space Station, it's time to put away their toys. Hundreds of LEGO toy bricks will soon be Earth-bound after spending two years circling the planet as part of an educational partnership between the Danish toy company and NASA. The astronauts have packed the iconic multi-color toys aboard SpaceX's Dragon, an unmanned commmercial cargo spacecraft, which is scheduled to leave the space station and splash down in the Pacific Ocean on Tuesday (March 26). The LEGO toy sets, all 13 of them, are landing with about 2,700 pounds (1225 kilograms) of cargo, including science samples from human research, biology and biotechnology studies and physical science investigations, as well as no longer needed equipment. The SpaceX Dragon is the only cargo capsule presently flying that is able to return station supplies to the ground, including experiments. Launched in 2011 on the final mission of the space shuttle Endeavour, the LEGO toys were used by the station crew members to demonstrate the effects of weightlessness on simple machines, including a trundle wheel, hammer and balance beam. The astronauts built the devices from the LEGO bricks and then filmed videos of them working with their creations. "I think most kids worldwide know what a LEGO brick is," former shuttle astronaut Leland Melvin, NASA's Associate Administrator for Education, told collectSPACE in a recent interview. "It is basically intrinsic in most kids' DNA what a LEGO brick is and I think the partnership has helped us let children see that they could build and develop in a 1-g [gravity] environment and then have them start to think about what it would be like for the device to exist, to work, or not work in a zero-g environment." Japanese astronaut Satoshi Furukawa poses with the LEGO model of the International Space Station that he built on board the real space station. The LEGO models, which for safety and simplicity were launched partially assembled, also included replicas of the space shuttle and International Space Station, the latter a 3-foot long (0.9 meters) replica that could only be built in space. On Earth, the space station model would collapse under its own weight. The LEGO toys' two years in space are coming to an end just as NASA has suspended most of its educational and public outreach activities for review. Mandatory spending cuts forced by the government-wide sequester has left the space agency to look for ways to implement cost-saving measures while at the same time minimizing the impacts to its mission-critical activities. The events' timing is, however, coincidental. The LEGO toys have been slated to return to Earth for some time, as the original terms of the NASA-LEGO partnershipcalled for a set span of in-space activities. Once back on Earth, some of the space-flown bricks will be returned to LEGO, while others are retained by NASA. According to Matthew Keil, an education specialist in the Teaching from Space office at the Johnson Space Center in Houston, the well-traveled LEGO models will eventually go on display. As for the future of the NASA-LEGO partnership, this may not be the last time the toys are seen on the station. "This partnership has been great," Melvin said. "We have some other things that will be going forward with LEGO. There is the new EV3, [LEGO's] Mindstorms robotics kits. I think we're looking at maybe exploring a relationship with those going to space station also." Click through to collectSPACE.com for a gallery of photos of the LEGO ISS floating aboard the real International Space Station.